… ok? All caught up? Good. My biggest challenge with this week’s episode was in scoring the episode’s stunning final scene, where Dale dies. As a fan of the show, I must say this scene was the biggest shock in the entire series thus far. Fans of the comic know that Dale survives for a long time in that narrative and, when he finally dies, goes out in a memorable manner. Killing him here, in such a trivial and meaningless way, seems cruel. However, choosing to end this character now has a remarkable effect on the series from here on out. 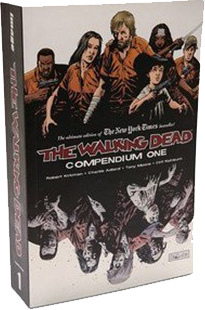 Fans who know Kirkman’s comic are caught completely off guard and get the message loud and clear: anything can happen. That’s what I love about the comic: the sensation that, at any moment, a major character can die. When I first read it, my heart was pounding virtually on every page. In order to preserve that thrill for fans who have read the comic, Kirkman, Mazzara and the rest of the writers must deviate from the source material, to keep us on our toes. When I first watched this scene with the producers, I was totally swept away in the shock and emotion. But, then the musical challenge sunk in: how was I to score this scene? When undead Sophia was revealed in the midseason finale, I wrote her a sweeping orchestral aria, a piece that reached nearly operatic heights. Surely, Dale means much more to us than Sophia, right? But, his death was staged in such a trivial manner. He didn’t die saving anyone, or sacrificing himself for some noble purpose. He just… dies. To write big, emotional music here would have undercut the shock and despair. As an alternative, I withheld the emotional music for as long as I possibly could. I underscored only the horror, using dissonant string clusters, pounding drums and angular distorted banjo lines. In fact, for the majority of the sequence, there’s nothing special about the music at all. It sounds just like a typical horror cue on our series. That’s what makes the sequence so painful. It was my intention that the familiarity in the music might trick the audience into thinking that we’re not actually going to kill Dale. The lack of big emotion in the score tells us that he’s probably going to be ok. This is all, of course, a big misdirect. I held on to that horror tonality as long as I possibly could: until the moment we see Carl’s face. This is where the music shifts. We’ve been with Carl for the entire episode and here, in this short shot, we see the weight of his realization crashing in on him. The walker he was toying with and accidentally freed is the one that killed Dale! This singular moment is the end of his childhood and his emergence as an adult character on this series. This powerful moment where we’re inside Carl’s mindset is underscored with a return of the Carl Theme. 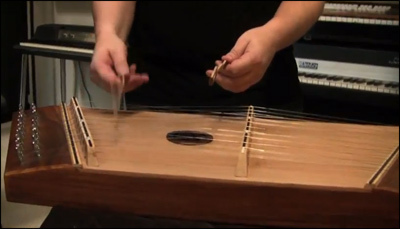 Like the statements of the theme throughout the episode, his theme is played simultaneously by a solo piano and two passes of hammered dulcimer, played with soft mallets. This theme could arguably be called the Dale Theme, but I hesitate to do that. We’ve never heard it before and we may not hear it again. I just wanted a haunting melody to emerge from the blackness, almost like a tunnel of light appearing to take Dale away. This somber yet beautiful melody tells us that, yes, Dale is going to die. It allows us to say goodbye. And hearing it played in Carl’s instrumentation (piano, doubled with dulcimer) ties their fates together. Though Dale will die and Carl will live, this moment will forever define him as a man. Perhaps there is some meaning in his death after all. Judge, Jury, Executioner was a challenging musical experience for me. However, nothing could prepare me for the task of scoring the final two episodes of Season 2. The following two episodes will take the series, and my score, to exciting and terrifying new places.